It felt like a coming home: the St Bride Library is the spiritual home of printing history in Britain. As well as a day of sold-out lectures there were printing demonstrations on the library’s machines and exhibitors selling everything from the Alembic Press’s limited edition books to Brian Webb’s witty Christmas cards printed by Phil Abel at Hand & Eye. 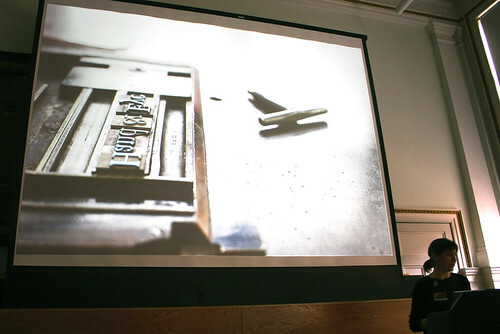 Speakers covered a huge range of letterpress-related topics: printer and publisher of Matrix magazine John Randle talked about work from the sunny Californian private press movement, Alex Cooper and Rose Gridneff of the London College of Communication showed the printing current students are doing in the college’s reborn letterpress shop www.letterpresslcc.co.uk and Alan Kitching and Celia Stothard told the story of the massive collection of poster woodtype they rescued from Wrington. Alan May had reconstructed Gutenberg’s wooden press while Harry McIntosh had made his Apple Macintosh run a Monotype caster. 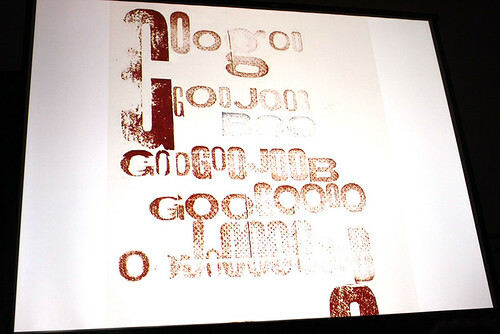 Patrick Walker from Sheffield’s Dust talked about the ‘emotional design’ that letterpress allowed him to achieve. It could have been a nostalgic day and a lament for the past: in fact there’s something about the immediate, low tech, handmade, open-to accident quality of letterpress that captures the spirit of these changed times. I must get that Adana 8x5 in the garage working again . . . 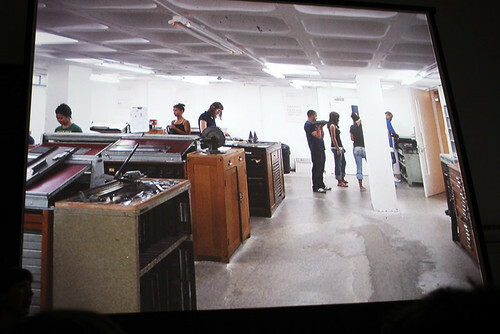 The LCC's letterpress shop: look, no screens. Composed and printed from letterpress ornament by Jackie Ford, LCC. Letterpress work by Sheffield’s Dust. 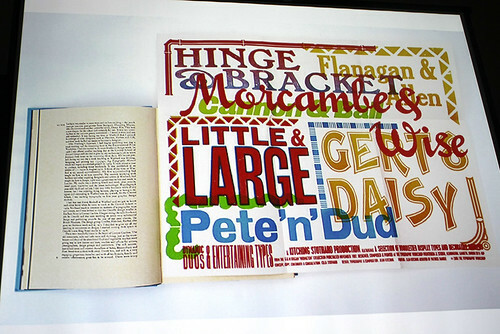 Kitching and Stothard’s poster of British comedy duos, set in Wrington type (an insert in Matrix magazine).